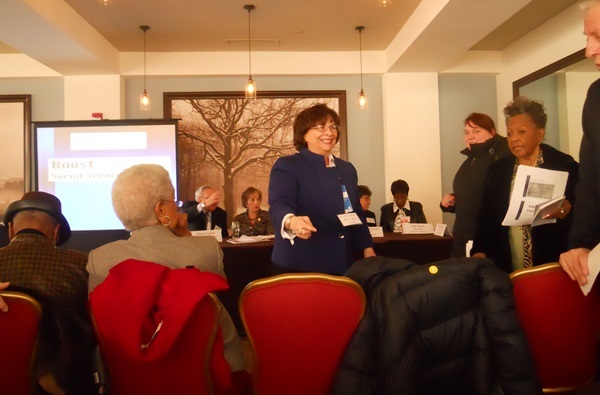 Maria Cordone, center, former Director of the IAM Retirees’ Department and current Executive Vice-Chair of the Democratic National Committee Seniors’ Coordinating Council, addresses senior participants at a recent Council meeting in Washington, DC. Nearly a hundred seniors and retirees, including retired IAM sisters and brothers, attended a recent Democratic National Committee (DNC) Seniors’ Coordinating Council meeting in Washington, DC, in preparation for the 2014 midterm elections. Maria Cordone, former Director of the IAM Retirees’ Department and current Executive Vice-Chair of the DNC Seniors’ Coordinating Council, says IAM senior and retired activists in attendance were re-energized and motivated to take on this year’s midterm races. “It was a ‘get results’ meeting and former Director of the IAM Retirees’ Department Charlie Micallef and I are anxious to work the 2014 election and beyond,” said Cordone. Speakers included Congresswoman Jan Schakowsky (D-IL); Chairperson Debbie Wasserman Schultz (D-FL); Mayor R.T. Rybak (D-MN); Rich Fiesta, Executive Director of the Alliance for Retired Americans; and a representative from the Committee to Preserve Social Security. The Seniors’ Coordinating Council was created in 1997 as an official body of the DNC.